Mrs. Emelia Amoako Asiedu presented on the topic “Institutionalisation of Performance Management (PM) in the Civil Service of Ghana: The Behavioural Perspective.” Her study explores the behavioural factors that influence Performance Management in the Ghanaian public sector and examines the effects of organisational context (such as socio-cultural norms) on performance management. The study further assesses the extent to which behavioural factors continue to influence performance in the sector and why institutionalisation of a meaningful performance management system in the public service has become a daunting task. 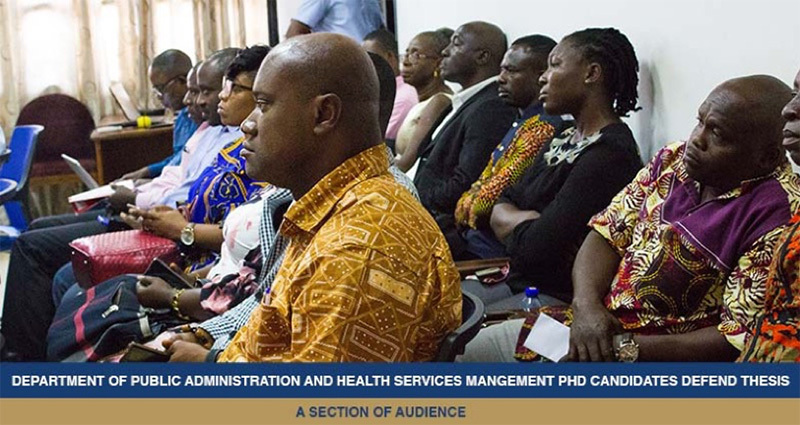 Using a qualitative approach with eight selected cases from ministries in the civil service of Ghana, the study found that to effectively institutionalise Performance Management (PM) in the public sector, there is the need for managers to move from the mechanistic way of managing performance of employees in the public sector. The study thus concluded that management of public organisations and policy makers need to consider the human side of PM such as employee behaviours, perceptions, attitudes and managerial interactions to ensure effective institutionalisation of PM in the civil service. Likewise, Mr. Benjamin Otchere-Ankrah’s thesis was titled, “Implementation of the Composite Budget System in Three Local Governments in Ghana”. His research examined the implementation of the Composite Budgeting System (CBS) using three selected assemblies in Ghana. The study relied on the Interactive Model by Thomas & Grindle (1990) and Integrated Model of Implementation by Winter (2003) which explain the factors that affect implementation of policies. Mr. Otchere’s study adopted the interpretive research paradigm and a qualitative research method by use of focus group discussions. His study found out, among others, that the CBS has brought about efficiency in the various assemblies and further recommends that the ministry of finance in collaboration with the ministry of Local Government and Rural Development should replace private commission collectors with permanent staff. It also suggests that the regional coordinating directorates be resourced to execute their mandate as espoused in the Local Governance Act (ACT 936). The candidates were scored by a panel of examiners based on their knowledge in the field of study, the study’s contribution to literature and demonstrated ownership of their work. Both candidates passed successfully and expressed thanks to their supervisors, examiners and colleagues present.